What does being on the web mean? I have asked myself that question several times. Does being on the web mean having a presence mean just another way to show that are you are on board “this shiny new phenomenon”? Well I am glad to say we over that phase. We have now realized that web is valuable and crucial channel to communicate, conduct commerce, and interact with people. The days of passive information consumption are gone and static web sites where content is not refreshed regularly are destined to be irrelevant. On that note I promise to all my blog readers to be more frequent with my postings, I have so far been posting only 2 month and I promise to post more frequently going forward. But let us go back to the fundamental questions. Why is your company on the web? What do you intend to do with your website? 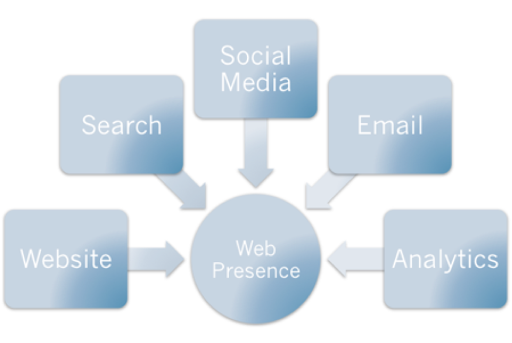 Generally from a marketing perspective, companies treat web presence as another medium of communication i.e. they treat web presence in the same vein as Television or Radio. The problem with that type of thinking is that unlike those in the traditional media, the web is an interactive media. Which means when you publish something that is irrelevant people will not engage with you. The reason why I am making this statement is because even today (yes, in this day and age), there are people that measure the success of a website with the number of hits. Real metrics are actionable and Vanity metrics are just a great show and tell effort and most of us are too old for that. Based on the diagram above, if I put analytics a contributor to your web presence. But you can only get good analytics if your web presence encourages your community to do something. Page hits mean nothing!!! I repeat Page hits mean nothing!! If you run a web based business and get 4 million hit a day but $0 to show for. You have ask yourself are you successful ? Time on site: This again is a “wannabe” useful metric. If spend 2 minutes on a site or 10 minutes on a site. What does it mean? I mean think about it. What is this metric saying? Number of Shares/Likes:With the advent of social media this apparently means something. If some one likes the content you have produced, well that is good. Ask yourself the question “So What?”. Will these folks who share your content actually will be your most vocal advocates. Advocates, now that is something. Now that I have bashed these metrics, I would usually add an “it depends” clause, but I am not going to. These are useless metrics no matter what the context is. If your audience does not know what web metrics are, these measurements make you look intelligent but you will eventually be called out. · Acquisition: How are people made aware of you? · Activation/ Registration: Do the visitors subscribe, use etc.? · Retention: Does a one-time user get engaged? · Revenue: How do you make money from such activity? · Referral: Do your users promote your product? If you carefully look at the first letters of all the elements it spells out “AARRR” like a Pirate, hence the term Pirate metrics. Top Keywords driving traffic to the site : The terms people are looking for to reach your site or associate with you. Usability and Reliability: How many problems, issues reported in the forums ? Churn: How many users and clients leave in a given period of time? Customer Lifetime Value: How much are clients worth from the initial acquisition to an ongoing relationship? These are the metrics that actually give you insight on taking the right course of action with your client base. I would not recommend that companies go metrics crazy and get into a analysis paralysis mode. What I would recommend is that have in mind what your target clientele is and have one metric that matters at each stage of the project. Just like everything else in business focus is an important element. This entry was posted in Digital Marketing, Metrics, Product Management, Strategy, Uncategorized and tagged Analytics, Digital Marketing, Product Management, Social Business, Strategy on April 6, 2013 by stynger76.